West Africa is making mixed progress on press freedom, access to information and the development of a pluralistic media landscape. 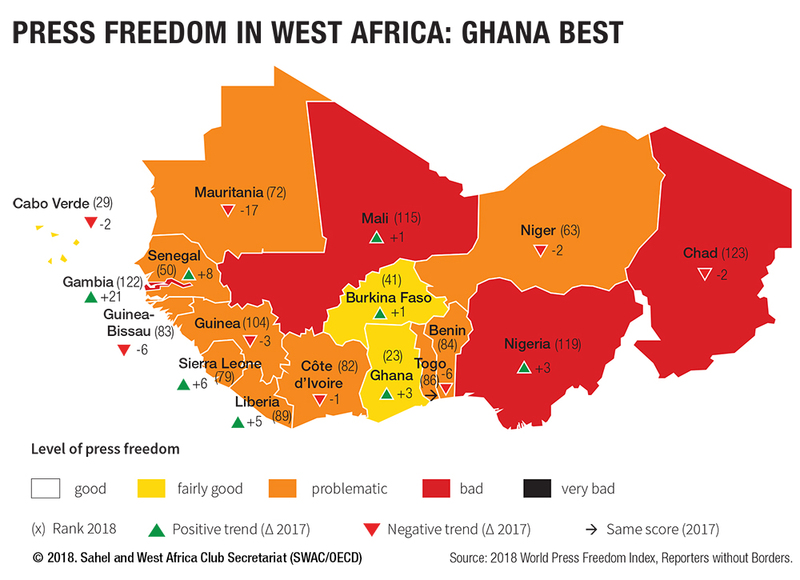 According to the World Press Freedom Index 2018, which ranks 180 countries worldwide, the level of media freedom was categorised as “fairly good” in three West African countries, namely Burkina Faso, Cabo Verde and Ghana. These countries achieved better or similar scores than many OECD member countries. Senegal might soon join this group. It improved its score by eight positions and enjoys a diverse media landscape. A new era for freedom of expression is finally emerging in Gambia, one year after President Yahya Jammeh was forced to step down after 22 years. Journalists there are no longer executed, new private broadcast and online media outlets have been launched and the government is working on reforming the legal frameworks guaranteeing freedom of expression and access to information. At the index’s bottom end, Chad, Mali and Nigeria still face serious challenges related to the safety of journalists and censorship. Abductions, arbitrary detentions, the closure of radio stations and Internet restrictions continue to hinder the freedom of expression and the public’s right to information in these countries. Moreover, media freedom has declined dramatically in Mauritania, which dropped from position 55 to 72, after several years of progress.